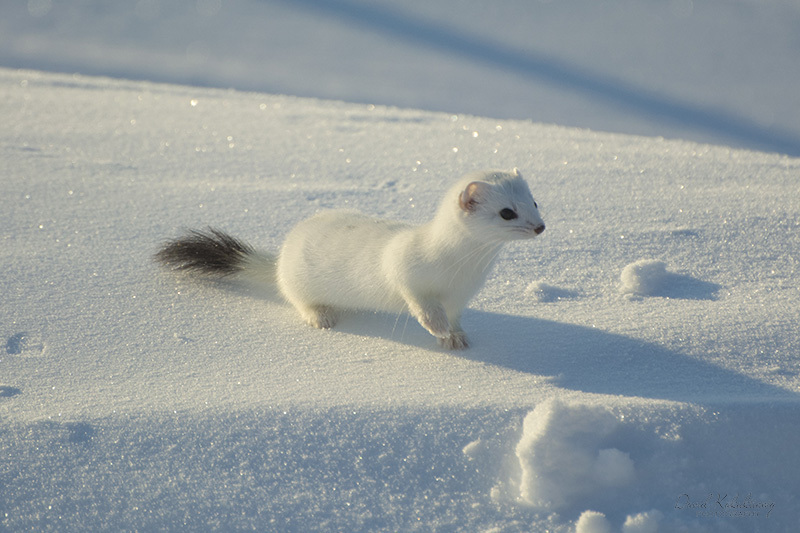 Ermine Weasel located in Nunavut. I was out for a morning drive and couldn't help but notice something catching my eye off the side of the road. I stopped and watched for a moment and it wasn't until this guy stopped for a split second that I was able to see what it was. Dozens of blurred and empty frames can partially describe how fast this thing was as it darted and sprinted in and out of it's tunnel system. I felt fortunate to capture this pose. Fabulous sighting David. Great light! You nailed the exposure on the whites. The low-angled light really works well here, David. The pose, with the raised foot, is sooooo cute! Wonderful image. Well spotted and a sweet pose with the tentatively raised forepaw, David. The angle of light creates some interesting shadows, although a touch of light on the face would be the icing on the cake. What a sweet pose with the paw up! I well understand the "dozens of blurred and empty frames"! Have been trying to "catch" a local ermine here. They are amazingly fast and erratic. Good job catching this one in a momentary pause (paws?) . I'd be delighted if I got this picture.